According to the National Institute of Mental Health (NIMH), one-half of all mental illnesses begin by the age of 14, but most are not diagnosed until 10 years after symptoms appear. Adolescents with mental health conditions are more likely to drop out of school, have substance abuse problems, and become involved in criminal and/or violent behavior. Suicide, the most serious and tragic consequence of mental illness, is the third leading cause of death for adolescents aged 12 to 18. NIMH statistics show that more than 90% of teen suicide victims have a mental illness at the time of suicide, and most are not in treatment at the time of death. Annually, more than 500,000 teens attempt suicide requiring medical attention. The NIMH notes that adolescence is an important time for early intervention to reduce the long-term severity of illness. The TeenScreen National Center for Mental Health Checkups at Columbia University in New York began 12 years ago as the Columbia University TeenScreen Program, a school- and community-based initiative to screen adolescents for signs of mental illness and risk of suicide. After nearly 10 years of success in the school- and community-based youth setting, TeenScreen expanded its program in 2008 to include outreach to primary care providers. This expansion was spurred by the fact that the primary care office represents a significant opportunity to reach adolescents and by the Mental Health Parity and Addiction Equity Act, which made coverage of mental healthcare on par with that of physical healthcare. This effort was buoyed by new guidelines published in 2009 by the U.S. Preventive Services Task Force, which recommend routine depression screening as part of adolescent medical care. Guidelines published by the Institute of Medicine in 2009 endorse evidence-based mental health screening for adolescents in school, community, and primary care settings. TeenScreen was among the first suicide prevention programs added to the National Registry of Evidence-Based Programs and Practices of the Substance Abuse and Mental Health Services Administration, which is part of Health and Human Services. Despite the national guidelines recommending mental health screening and efforts by physicians, teens with mental illness may still slip through the cracks in the primary care setting for various reasons. But screening via a self-reported questionnaire in the school and community can be effective for identifying adolescents at risk of mental illness. Research has shown that adolescents are more forthcoming on self-completion screening questionnaires than they are when asked the same questions in person. Approximately 600 sites in 38 states are implementing the TeenScreen Schools and Community program with documented success, says Leslie McGuire, MSW, deputy executive director of the TeenScreen National Center for Mental Health Checkups at Columbia University. One of those sites, Jackson Public Schools in Mississippi, has an eight-year history with TeenScreen. Gloria Whitley, LCSW, social service coordinator for the school district, initiated a TeenScreen program in 2003 when, as the lone school social worker for all middle schools in Jackson, she realized many students capable of learning were dropping out. Whitley met with school administrators, state government representatives, higher education officials, and family support agencies to establish the program. She secured funding from the Mississippi State Department of Mental Health, which continues to fund the program. Whitley established an extensive network of providers to handle referrals for students screening positive for mental health issues and coordinated options for care for individuals with and without insurance, with low family incomes, and with busy personal and family schedules. For example, she partnered with a local university to provide free services for lower-income families, a local Catholic charity with a mobile unit for in-home counseling, and local community mental health centers and private providers. These services are available in addition to in-school counseling services. “It’s one thing for students to be screened, but if we don’t include access to services, then screening is not a useful tool,” Whitley notes. Whitley also assisted in the formation of a team of professionals to help with reviewing emergency cases presented by social workers or other members of the screening effort. The team recommends interventions that can be implemented on a local level to support at-risk teens and keep them in the community, providing major support to families, says Whitley. TeenScreen has identified students with depression who may be overlooked, enabled them to get help, and helped them graduate from high school and even go on to college. “The value of this program is really to help identify youth with mental disorders who may otherwise have gone unidentified,” Whitley explains. According to Whitley and McGuire, the Jackson TeenScreen program has helped reveal other serious challenges faced by Jackson public school students, such as bullying and homelessness. “The structure of the TeenScreen program creates an atmosphere where kids want to participate. When they feel comfortable that what they say will be kept confidential, we have found that they are more willing to disclose issues they are facing. TeenScreen provides an opportunity for the student to have a private, positive conversation with an adult that they otherwise would never have,” Whitley explains. An ad hoc referral process has traditionally identified adolescents with possible mental illness, where teachers, parents, or other students report potentially at-risk students. “We know that this process misses many suffering from mental illness,” says McGuire. The proactive stance taken by TeenScreen finds those who are suffering in silence because all adolescents are screened using a questionnaire about their emotional health. TeenScreen program outcomes have been researched and report a high level of success in accurately identifying youths with mental illness or who are at risk of suicide and would not be identified otherwise. 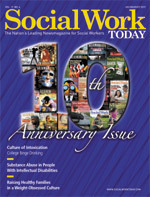 A study by Husky et al, reported online in 2010 in the Journal of Adolescence and conducted in an urban school district in western Pennsylvania with four high schools, found that systematic screening using a TeenScreen was significantly more effective at identifying at-risk youth and providing referrals and greater access to mental health services than traditional school-based services designed to identify and help at-risk students. This study compared mental health services referrals among ninth-grade students randomized either to referral via TeenScreen (n = 365) or via the traditional process of identification by school personnel, parents, or students (n = 291). Of the 365 students in the screening group, 71 were deemed to be in need of further evaluation and possible treatment and were referred to appropriate mental health services. In comparison, of the 291 students in the control group, only three were referred for assessment and possible treatment. “Social workers can become involved in TeenScreen by becoming site coordinators, clinical interviewers, or case managers for local TeenScreen Schools and Communities programs,” McGuire says. She emphasizes that social workers are ideally suited for TeenScreen due to their skills and training, and they are well positioned in the school and community to become involved in mental health screening. “They also can take the lead with the most important aspect of the TeenScreen process—linking adolescents identified through the screening process to resources in the school and community for further evaluation of their mental health,” she notes.